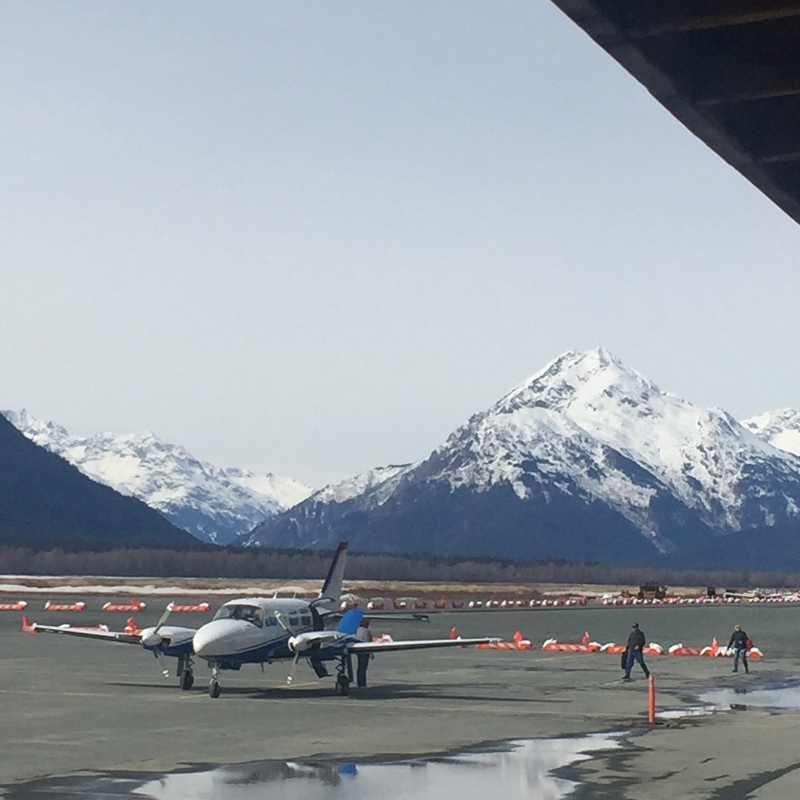 Spring Sunshine Tour of Alaska! Ok, time has got away… I started writing this entry right after I got home from our Alaska tour, in April, and then didn’t finish it until now! 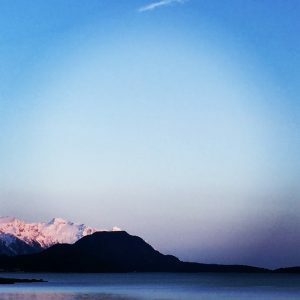 It’s a bit late, but our trip to Alaska deserves to be noted, so here it goes. In an unusual stroke of good fortune, sunshine followed us through Alaska. Not that we’d enjoy Alaska less in its usual dressing of rain, but heck, it cheered us all to feel that sunshine direct on our skin for the first time this year, and to see the sun beaming down on those epic landscapes. It seems everywhere you turn, there is another stunning mountain range, alongside a gorgeous waterway. 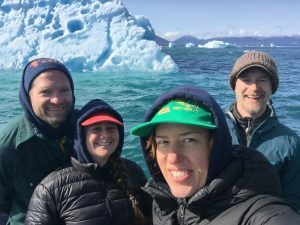 We toured AK for two weeks, and we had an absolute blast. 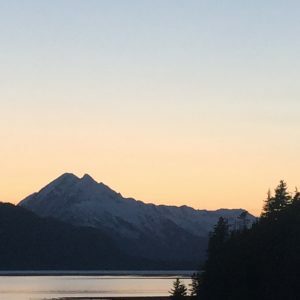 We have always found a special connection with Alaska, and I was sitting here thinking about how to describe that… I guess we bond in a northwest kind of way, we all love the wildness of nature and the sense of space that is in the Pacific Northwest and on up the coast. And we want to protect that, and care for it. And moreover, they celebrate and value music, food, and fellowship in a way that is unreserved, and they don’t mind showing it. It really comes from the heart, and we are kindred spirits in that regard. One of our favorite things is traveling to play music in small towns. And we did that a lot on this tour. In fact, we only had one show that wasn’t in a small town. People seem to appreciate it all the more that we took time to travel to them, and bring them some music. Maybe it is the lack of frequency of live entertainment that makes it feel so important, but whatever the case, it’s good. And it brings the community together, to share a common experience that is hopefully a moment apart from life’s stresses. We really had great audiences everywhere we went, and for the first four gigs we were accompanied by our guide, driver, and fearless assistant, Garren. 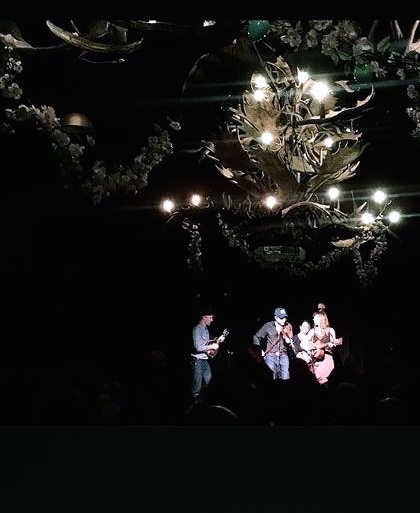 We started in Palmer at Vagabond Blues, then played a night in the beautiful ballroom of the 49th State Brewery in Anchorage, ‘neath some epic moose horn chandeliers. Both of these shows were full up, and we were welcomed to Alaska by a couple of fired up audiences! We were hosted in Anchorage by our good pals the magnanimous Marvin family who fed us, showed us the resident moose, and gave us soft pillows at night. We went from there on down to Homer and Seward on the Kenai Peninsula. Though the rest of the band had been to Homer many times, it was my first time. We were happily accompanied by some good old friends that drove down from Anchorage with us, so I was given a proper tour of the place, by some old hands, telling stories in the car on the way down, and promptly taking me to the Homer Brewery for a glass of birch bitter in the sunshine. The next morning it was out the spit for a magnificent view all around of water and mountains. We played at Alice’s Champagne Palace, a perfect little dance hall, complete with dark smooth-worn plywood floors, and chandeliers. People showed up with bellies full of Easter dinner to dance it all off again. 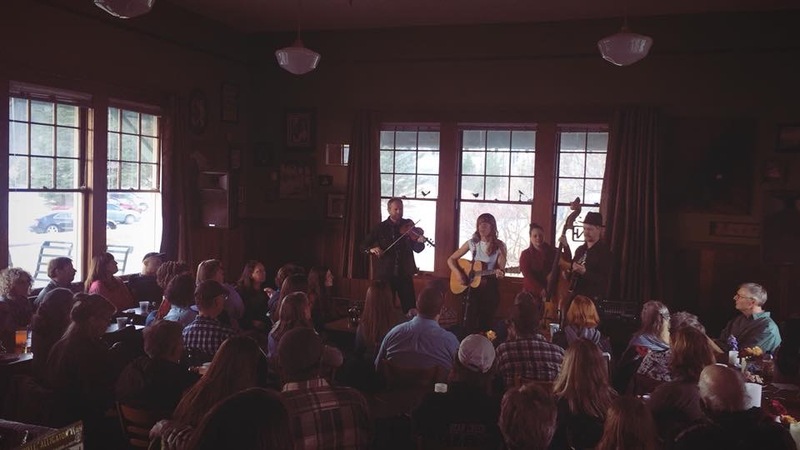 We drove the beautiful drive to Seward the next day to play a concert at Zudy’s Cafe, a lovely eatery inside of an old railroad depot. The acoustics were easy in that big open room, and people packed in there like sardines. It was hard to take our eyes off the view out the window! Very distracting. We had to drive on back to Anchorage that night back to the bosom of the Marvin residence to catch our morning flight to Petersburg. From here on out we were getting into an airport culture that I could really dig. No funneling through sickeningly perfumed shopping experiences, no overpriced eateries selling crap food, no stale air, no eternal security lines, just a walk from the plane through the great outdoors into a little room where the baggage came through a wall passthrough, and there was only one ticket agent and a small waiting area. We could’ve walked to town from there. But our gracious host Josef was there to greet us, and for the next two days, he gave us a memorable tour of Petersburg. We started off playing on the community radio station to promote the concert the following evening. It was snowing big fat flakes all afternoon. That night we played music at the weekly Tuesday tunes session. Someone in town gifted us a smoked black cod, and the next night, a beautiful salmon, and Josef cooked both to perfection. Plans for the following day were hatched. Josef would take us in his boat to see Leconte Glacier. We packed a lunch, and after an excellent breakfast at the Salty Pantry, we were off. It was a bluebird day and we sped across Fredrick Sound toward Leconte Bay. 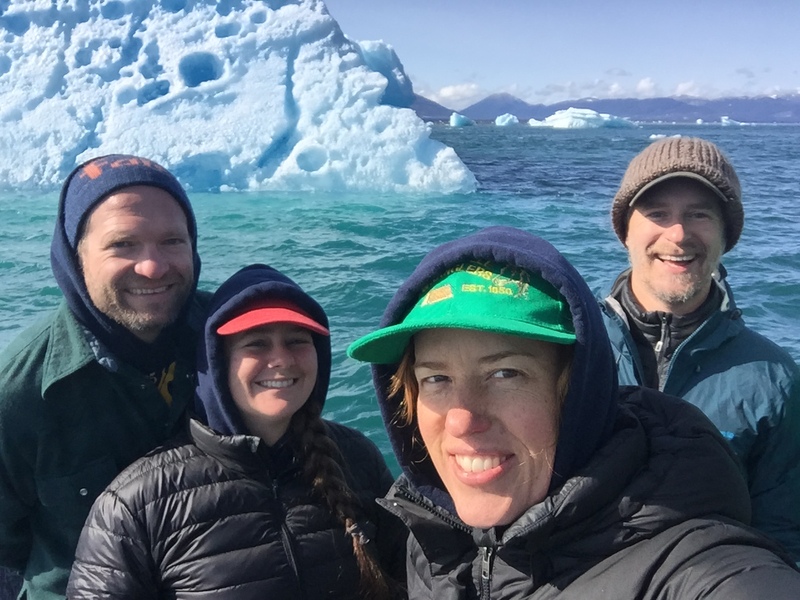 As we neared the bay, we started to see icebergs, icy blue translucent sculptures floating slowly out of Leconte Bay, massive bits of the tidal glacier that had calved off and were suspended there, almost eerily. As we circumnavigated some of the burgs, I imagined how I’d heard of them suddenly flipping over in the water as just enough ice melted to set them off balance and roll. Some were bottomed out, standing sentries atop jet black beach rock, deposited there by the tides. Josef skillfully inched his way through floating ice chunks, and then sped along when there was clear water. The farther we got up the fjord, the mountains drew closer, and the view become more and more stunning. And at last, we rounded the corner, and saw the glacier! 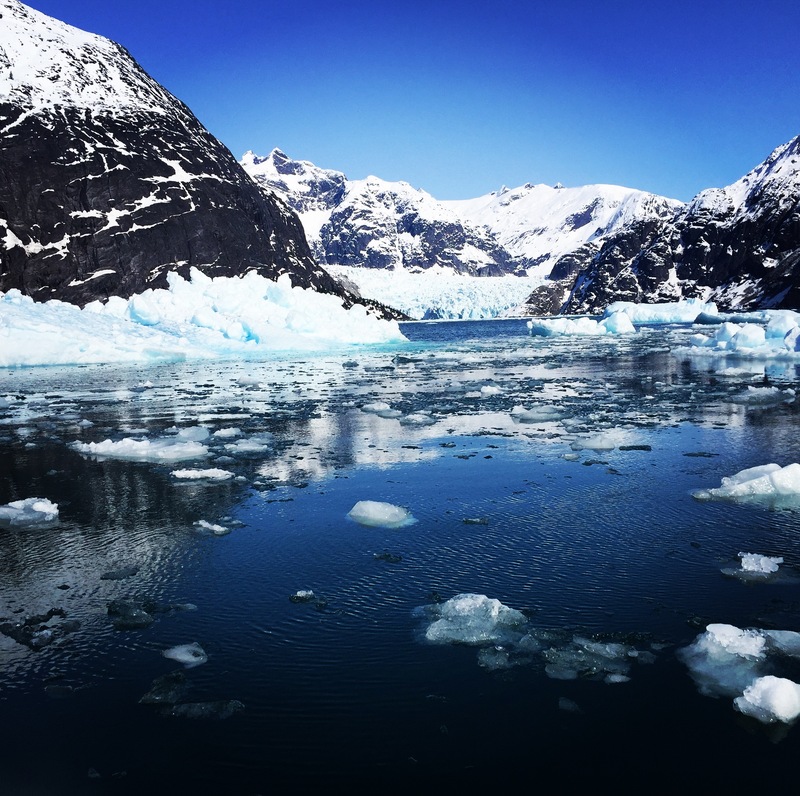 It was breathtakingly massive, and we couldn’t help but think of how old all that ice was, and how long it took to creep its way down the long valleys to the sea. We kept a safe distance, and Josef killed the engine. 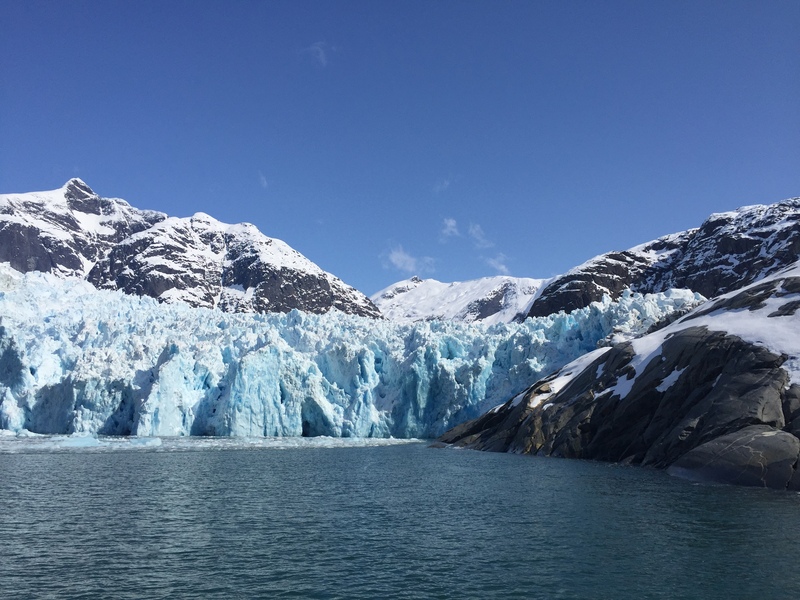 We sat in silence, watching and listening as pieces of glacier ice calved into the water. The sun was warm and it was a hallowed experience none of us will soon forget! The places old time music takes you! Once again! As we arrived back in the harbor, it was time to get ready for the show, and do our sound check. The show was in the high school auditorium, and we had a great audience that night. There was a growing flock of dancing children that broke the ice and before long many of the adults were up in the aisles dancing too. Next morning we flew to Juneau, and had a night off before taking the Alaska State Ferry up to Haines. We stayed with our friends who were getting ready to host a wedding dinner the next week, and before we knew it, we were making ourselves useful by helping them wash windows, and construct a roof over the outdoor deck. So there you have it, Foghorn Stringband can put in a little good honest work! The ferry ride was pretty epic. 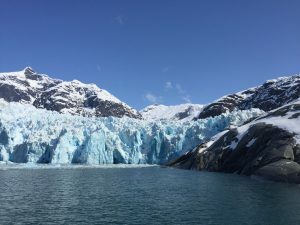 As we glided along the Inside Passage, from our quiet and comfortable seats in the front of the ferry, we sat and watched snow capped peaks dropping into the ocean passing us by set by set. 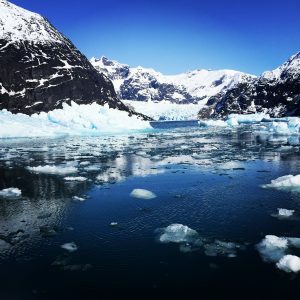 Beautiful inlets and glaciers, little islands, and birds just became almost something you’d start to take for granted as the hours ticked by but then you’d wake up and think, “Holy crap! Look at this place!” We were picked up at the ferry landing by our friendly hosts, members of the Arts Council of Haines, who took us to our B&B, gave us a resident car to use, and showed us the lay of the land. 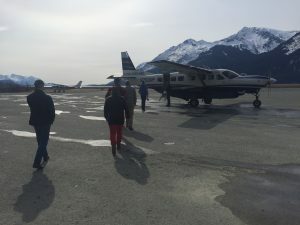 We stayed in Haines two days. We settled in and then got over to the local public radio station for an interview to promote the show that night. Haines was good to us, and we had some time the next day to go for a hike, and visit with some friends who had come down from the Yukon. Since we had the night off we went for a session at the Pioneer Bar that night. Our flight the next morning took us back to Juneau, and we prepared for the evening’s house concert there. Our hosts had prepared a big gumbo, and the house was filled with friends new and old. There was only one show yet to play on our tour, and that was at the Rendezvous bar in Juneau on the Thursday night of the Alaska Folk Festival. We would otherwise enjoy the many festivities of the Folk Fest all weekend long. 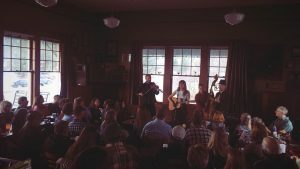 The Folk Fest is in its 44th year I believe, and it is one of our favorite festivals, one we try not to miss if we can help it. The festival takes place in Centennial Hall, and for most of a week, performers of all scopes, (from exceptional professional musicians to musicians performing for the first time ever, and everything in between), give 15 minute performances in front of a large audience seated in the vast, dark, warm hall. It’s also broadcast live on TV and radio, so you can tune in wherever you are. And it’s eclectic and amazing to take in what comes by. Much of the time it’s actually amazing, and sometimes, it’s amazingly painful! But even when it’s painful, the audience is ever encouraging, and many an accomplished musician has got a start there. There is also a featured guest artist/band each year who gives workshops, and full length performances in the hall. This year it was Pharis and Jason Romero. In addition to all of that, there is, concurrently, (though unassociated in any official way with the Folk Fest), an array of bar shows at night downtown. I don’t think I’ve ever witnessed such a smorgasbord of great live bands playing night after night in various bars mere steps from one another. It’s a music-lover’s or a bar-hopper’s dream! R&B, bluegrass, country, old time, jugband, you name it. And every bar is packed and rowdy! 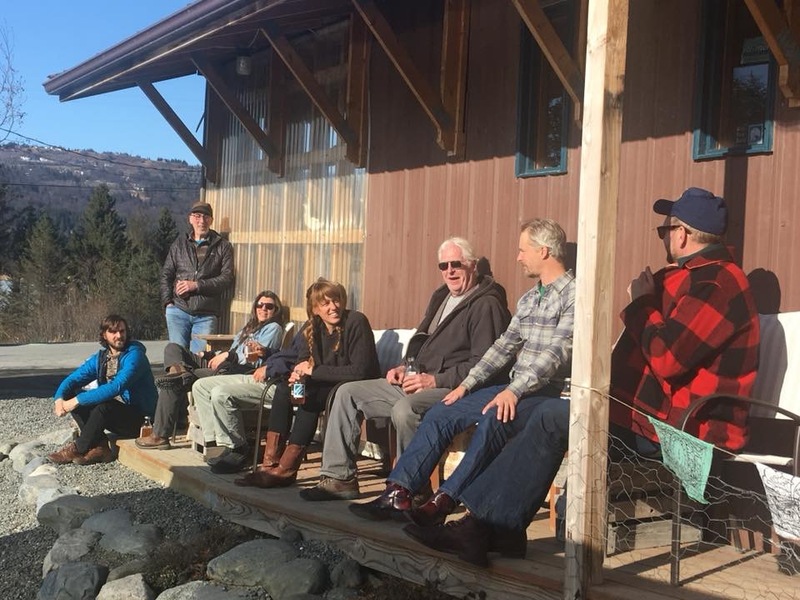 Friends and acquaintances from all over the place, (Alaska and elsewhere) trickled into town that week for the Folk Fest, and it was a happy reunion that would inspire much music-making and merriment of all kinds day after day and night after night. Our Foghorn set at the Rendezvous Thursday was aptly scheduled before we would be too worn out with festivity, and the bar was packed full of dancers and watchers. We love playing for a rowdy crowd like this, and we slung tunes and songs as best we could. There was a devoted crowd of dancers up front, and at the break we invited our ponderous local celebrity friend Jay on stage to accompany us with his large and heavy banjo. We aren’t exactly sure why Jay is a celebrity, and yet we know in our heart of hearts exactly why he is one. At any rate, there was an assembly of adoring Jay fans (including all of us in the Foghorn Stringband) secretly wearing Jay Marvin t-shirts which were revealed en mass as he set foot on the stage. This only fed the fire and what followed was a whole lot of chanting and crowd surfing as we played on through the night. 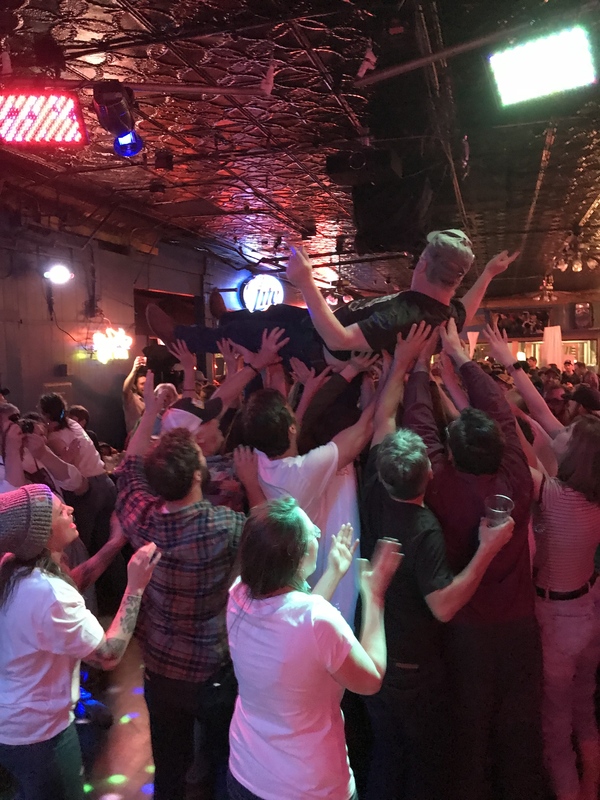 Crowd surfing to old time music, well, it was a rowdy enough night. Loved it. Thanks Alaska. And thanks to KTOO for the video shoot on the boardwalk in the sunshine! Alaska, we do love thee. Hope to come back and see you real soon. Coming up: Foghorn reconvenes in New Hampshire for Miles of Music in mid June. And then it’s time for the National Old Time Fiddle Contest, Weiser out in Idaho! And then the Great Big Fais Do Do in Portland, a festival was started by Caleb 5 years ago and is a whole lot of fun and dance music. Foghorn will be performing as a square dance band, as well as accompanying Jesse Lege and Joel Savoy as the Cajun Country Revival later in the weekend. Caleb and I will be a Voiceworks in Port Townsend, and then in July we all meet again in Port Townsend for the Festival of American Fiddle Tunes. 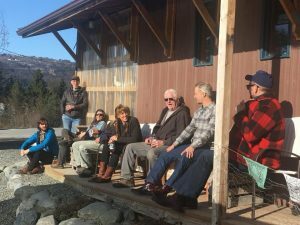 New at Fiddle Tunes this year, please check out the Lucas Hicks Shining Light Front Porch Fellowship if you wish to contribute, or perhaps apply to be a fellow in upcoming years. Looking forward to all of that! Come join us!